"Excellence in Small Animal Care"
Since 1978, Bluestem Animal Clinic has been providing companion pets and their owners with excellence in small animal care. 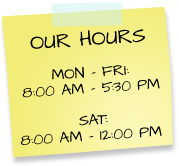 We strive to provide exceptional veterinary care in a warm, friendly atmosphere for you and your pet. The relationship you share with your pet is one we feel should be nurtured and supported to enhance the quality and length of life for your pet. The foundation of our relationship with your beloved family member and you, is regular wellness exams and preventive care. We offer nutritional counseling, supplements, microchip lost pet ID, tailored vaccination schedules, parasite screenings, preventives and much more. If illness or injury do occur, we offer laser surgery, as well as therapy laser. We have an in-house lab for most routine diagnostic blood and urine testing and on-site radiology. If you're looking for a caring and professional animal clinic for your pet, come to Bluestem Animal Clinic! New pets receive a complimentary exam! Sign-up using the form or call us at 316-321-0811 to take advantage of this exclusive offer.